It's all about Action and Independence! What is it about parenting toddlers? If you thought your baby boy kept you busy, then you ain't seen nothing yet! 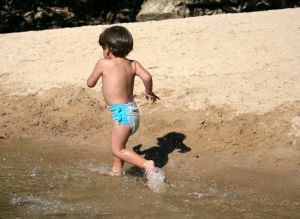 As soon as your little boy can walk with confidence and run, he is all movement! You have to keep your eyes on him all the time. Who said parenting toddlers was easy?! What you need to understand is that boys this age have their own agenda. They are focused only on their own needs. And the agenda is action and independence. I have mentioned the so-called terrible twos earlier. The term is a little bit misleading because that phase actually usually starts around 2 1/2. It's a time of opposition, aggression and anger that appears to be deliberate and willful. Between 18 months and 2 1/2 toddler boys still appear mostly loving and affectionate. They are also very active and searching autonomy but it is usually better perceived by parents than the later phase. Yes, parenting toddlers is challenging some days, but the way you react to your boy's search for autonomy and high level of activity is very important! 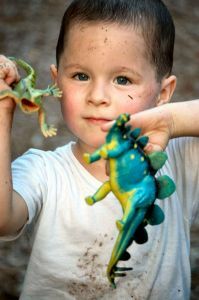 Research has shown that boys are more active than girls and are usually behind in terms of language development. They also tend to get frustrated more easily than girls, probably because of their less developed language abilities. They don't seem to be as interested in the reactions of the adults around them. All this leads to stronger reactions from parents in response. They are parenting toddler boys differently from the way they are parenting toddler girls. In babies, gender doesn't seem to be important for the level of activity. Individual temperament seems to be more important. The differences by gender start to appear around 10 months. Boys become less compliant than girls. This difference between genders will increase between 1 and 2 and keep doing so until school age. At that stage, the majority of boys are more active than girls, regardless of their temperament. Because of this main difference, parents need to manage their boys' activity levels. Toddlers cannot control their impulses. If your toddler boy kicks or punches just after you told him explicitly not to and looks at you straight in the eyes while doing so, it does not mean he does it to provoke you. He is just acting in an age appropriate way and you should not tell him he is a bad boy. It is better to tell him "No", "Stop", "We do not do that", etc. Don't get me wrong, they DO need discipline, but NOT retaliation such as corporal punishment. It is always important to keep age appropriate behaviors in mind when parenting toddler boys. By the time your toddler is 3, he should start to be in better control of his impulses. After reading all this, you are probably wondering what has become of the close bond that once existed between mother/father and baby boy. Well, the bond is still here, it's just different! In this time of action, it's more of an "on and off" thing. What is important for your toddler is to know that you are here "in case". This is where boys differ from girls. Research has shown that boys don't check their moms so much when playing. Little girls tend to make eye contact with them often and search their approval. Boys still need their mom as much as girls do, it's just less obvious. Let's look at the development of your toddler now, because knowledge of age appropriate behaviors is a useful tool when parenting toddlers. The keyword for this age phase is movement! Toddlers are always on the go. As a result, they lose their baby fat and look much leaner and grown up. 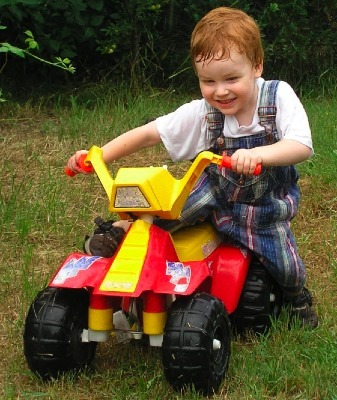 By 18 months most boys will be able to walk without support and will be focusing on improving their balance. They should be able to get up and down stairs unaided, but they can't alternate feet yet. They are also starting to run. At 2, boys enjoy rough play very much! So much so that they love to throw themselves in their parents arms or jump from the stairs unto them. They can ride a tricycle but might still need some help to master pedaling. At that age, they are also ready to start potty training. Now, that should please you, no more diapers! Just make sure to not make it a power struggle. By age 3, arm and leg coordination is greatly improved. Your toddler can now throw/catch a ball or kick for instance. He should be able to dress himself with simple clothes (such a elasticated pants or tops without zipper or buttons). 2-year olds love company but they are not very good at being friends. They are very attracted to other children (girls and boys), which is good to develop their language skills, but are not very good at playing with them. You will often see toddlers playing alongside, not together. This is because 2-year olds are just starting to develop empathy and do not understand the concept of taking turn. For these reasons, keep in mind that toddlers playing together should always be closely supervised as situations can deteriorate very quickly! You might think that your toddler doesn't need "friends" as he seems to be indifferent to them. But he really does like being with them even if it's not obvious and, by the time he is 3, he will start to refer to them by name and seem to be quite eager to meet them. At this age, your toddler will also start to show a preference for male friends. It is totally normal and shouldn't be something to worry about. It's part of a healthy development. Between 18 months and 3 you can really see a little scientist in action! You can see your son trying to figure things out in his mind. If he is trying to open something, you see him trying to understand how the mechanism works. When he tries to make a puzzle, he observes the pieces carefully to figure out where they go, etc. He can now see the relationships between things and it also manifests itself in pretend play. Toddlers understand that people and things are different because people think, act and have emotions. You might now be thinking that they are pretty similar to adults then. Well, not exactly, their thinking is still magical, which means that they can see physical laws but don't necessarily think they apply to them! The big challenge here for your toddler is to learn to manage his feelings. That is no small task and it will take a part of his childhood to achieve it. Let's just say that 3-year olds are better at it than 2-year olds, just because they've had more practice! How can you help him learn? Children constantly read their parents faces. Your toddler needs to see on your face that you are here for him and calm. If he feels scared in a certain situation, it will make him more confident to see his mom looking confident herself. What would be damaging to him is to see disapproval on your face when he is scared. He needs to be reassured and not feel like a failure. I hope these facts will help you with the challenging task of parenting toddler boys. It can be physically and emotionally draining but can also be so rewarding! Toddler boys are incredible, one minute they seem to not have one thought for you, the next minute they are all over you. I guess it's part of the charm of our little boys and why parenting toddlers has been such a joy to me. Whether you are struggling with a specific issue or you want to look for activities to do with your toddler, check out Ingrid's site Toddlers-Are-Fun, it's packed with useful information!